It’s that time of year again, the good weathers coming out, it’s finally time to go camping again. It’s also the season when everything you own needs a good old spring clean. So before you go anywhere, get your chamois cloth out and give your recreational vehicle a good old-fashioned scrub. A step ladder might help too! So to help you dust off the cobwebs, polish your surfaces and wax down your exterior, we’ve come up with some helpful tips to make your spring-cleaning job much easier. The system: Wash, clean, polish, wax and maintain. Obviously unless your headed to the bus depot anytime soon, you can’t just get your motorhome through a carwash, and we at Think condemn the use of pressure washers on motorhomes. They are no good for your vehicle. The paintwork won’t suffer from the water pressure but its window rubbers and seals will, and of course motorhomes have many of these. So instead we recommend you use your readily available elbow grease and wash the motor by hand. Honestly, it’ll take a lot less time than you think. With a hosepipe and some soapy water at your disposal you will have an easy enough time scrubbing. Buy some decent polishing sprays, some nice wax, try products like autoglym, and that should take any real tough parts out of the equation. 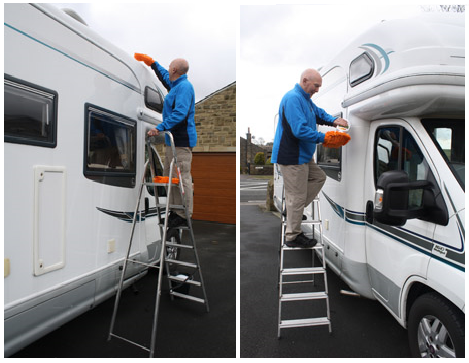 Polish will give your motorhome that new look shine. Just don’t apply too much of the polish or you may get streaks. Put the polish on a pad and wipe the vehicle down. Remove any leftover bits with a clean cloth. Wax time. Get a decent chamois cloth or a waxing device and work the wax in lightly and smoothly. Channel your inner Karate Kid and wipe in a circular motion. Waxing machines will take out some of the effort but a cloth will do just fine. Regular cleaning and maintenance like in all walks of life will make the cleaning job a lot easier. Shoot the dirt off with a hose or wipe the bird poo off with a warm sponge and you’ll save having a big job at a later date when the dirt bonds with the surface. A great hassle free method of maintenance is to buy a cover for your motorhome, this way it won’t get dirty unless you take it out. Make life easier for yourself! Insure your Motorhome today with Think! This entry was posted in Motor Caravan Insurance on May 16, 2014 by admin. A caravan was spotted hanging off a grass bank into a river behind a motorway service station in Gloucestershire. The caravan appears to have been abandoned as no one was around to claim it as their own, rumours speculate that it could have been stolen or fly-tipped. Adrian Sherratt, who photographed the abandoned vehicle, thinks the owner may have been stopping for coffee and reversed a little too far when trying to get a scenic parking space by the river. ‘It looks like someone’s been passing and got a bit too close to the edge. Mr Sherratt added: ‘I’m surprised they managed it because it’s been very dry since the floods. The bank shouldn’t have been too slippery for them. The Stroud District Council have been informed about the caravan and are said to be preparing its removal from the area. Accidents can happen, so it’s important to make sure your caravan or motorhome is fully covered. To see how much you could save on your caravan insurance, get in touch with Think Insurance today for a quote. This entry was posted in Motor Caravan Insurance on March 31, 2014 by admin. 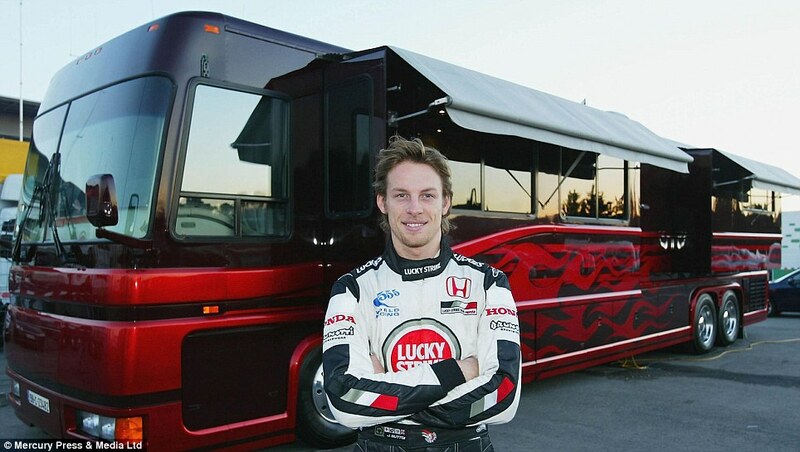 A lavish tour bus that was once used by F1 aces Jenson Button and Jacques Villeneuve has been transformed into a luxury getaway motorhome. The extravagant vehicle has been said to be the first million-dollar motorhome to be createdin the world and is now being offered to the public as a ‘seven star’ hotel costing £8,000 a night. As well as having a 24 hour personal team of waters on hand, guests will also have access to a limousine and helicopter, and greeted with champagne and a complementary hamper on arrival. The 500 sq ft motorhome features a luxury interior with a 42′ plasma TV, fully fitted American-style kitchen, a walk-in wardrobe and a gold ensuite bathroom. 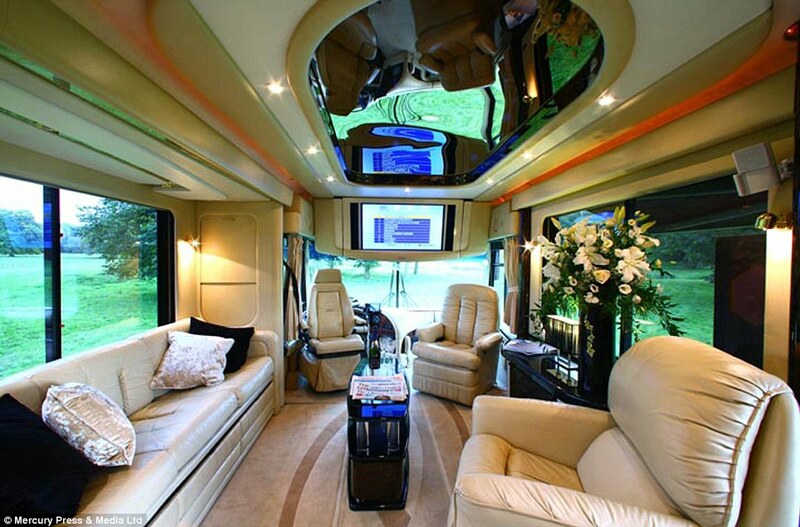 Hand built by U.S. company Newell, the palatial motorhome sleeps up to four people and is coated from floor to ceiling in leather. Icon Experiences owner Andrew Morris said: ‘The Icon is a living piece of history. A unique motorhome, which was the first million dollar motorhome to be created. ‘We do have preferential privileged locations both in the UK and throughout Europe but we’re more than happy to drive the Icon to the location of your choice. ‘With our 24-hour support team always discreetly on hand, we will ensure that all the normal rigmarole of hiring a motorhome is taken care of. Mr Morris added: ‘It was made especially for life on the race circuits of Europe and has been home to Formula One drivers including world champions Jacques Villeneuve and Jenson Button. This entry was posted in Motor Caravan Insurance on January 9, 2014 by admin. A caravan in Varvel Avenue, Sprowston, caught a blaze last week while sitting in the owners back garden. 16-year-old Forrest Brown was in the family home at the time of the fire, he said “I could see that one of our conifer trees was alight, I tried to put it out myself using a bucket of water, but it did not work. The fire then spread to the caravan. The fire had completely destroyed the caravan and left damage to the facing wall of the house. Although the caravanwas only worth around £500, it contained items worth around £2,000. It was reported that there were gas cylinders in the caravan, which the fire crews made safe. Anyone with information should call Sprowston police station on 101. If you have a caravan or motorhome that needs insuring, click here to visit Think Insurance and fill in an online quote form today. This entry was posted in Motor Caravan Insurance on December 19, 2013 by admin. Ogwen Bank caravan park has been given permission to stay open all year round. The planning permission was initially seen as controversial but has now been approved by Gwynedd council after the planning inspector decided there would be no negative impact. However, with being open throughout the year, the park must keep up-to-date records of residents’ primary addresses, to prevent the caravans becoming de facto homes. If you need motorhome insurance, get in touch with Think Insurance today for a quote. This entry was posted in Motor Caravan Insurance on December 18, 2013 by admin.